What is it and who is it for? Kaya Purifying Nourisher is a moisturizer enriched with almond oil and rose extracts specially designed oily and combination skin to have acne free skin. No, avoid contact with eyes. If contact occurs rinse eyes with cold water. Apply to cleansed face and neck and massage gently in an upward and outward direction. best results when used with kaya purifying cleanser and kaya purifying toner. 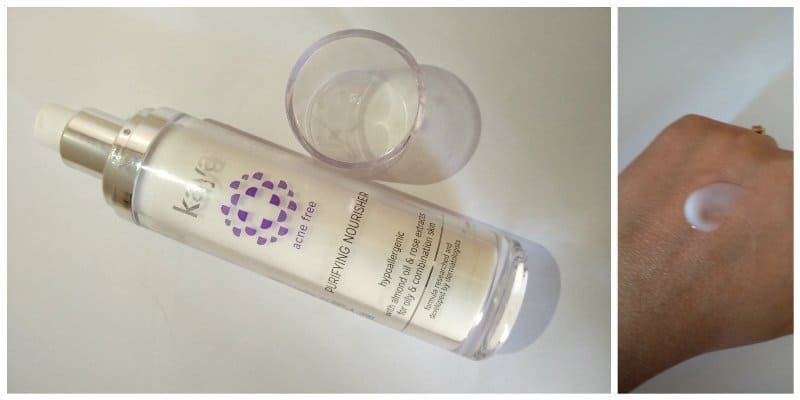 This serum comes in a sturdy white colored pump bottle. Pump bottle makes the product hygienic and travels friendly. The serum is a white gel which gets absorbed quickly into the skin. I have combination skin and oily-zone so I have to be very cautious while choosing and moisturizer. This product moisturizes skin and does not make my skin to break out. after cleansing and toning generally put the tiny amount and apply all over my face and my skin feels hydrated. This product contains almond oil and rose extracts so that soothes and nourishes irritated skin. With regular use, I felt it made my skin soft and healthy as well as it didn’t get me clogged pores. I also use it under my daily make up that keeps my skin look fresh and hydrated as well as it does not make my skin look oily. Yes of course. It is life saver light moisturizer for oily and combination skin people like me.